Happy "News" Year from The Ronda Reporter! Nope, this isn't the usual sentimental, emotional, thought-provoking New Year's blog posting where I share my hopes, dreams, resolutions and promises for the year to come. Truth be told, this "News" Year posting is about -- and was inspired by-- my newspaper nail design! And, I thought my newspaper nail design went well with my New Year's champagne. Why "News" Year? Cause this is the Ronda Reporter. Our family newsletter...like a newspaper. News...New Year... Okay, maybe I've had one too many glasses of celebratory champagne. But there you have it. How's that for a shallow and completely unsentimental blog to kick off 2014?!? But in all seriousness, whatever your goals, resolutions, and aspirations for the coming year, I wish you much luck and success. All of us here at The Ronda Reporter wish you and yours all the best in 2014! Happy New Year! My father-in-law arrives to pick up me and my husband in his "vintage" sky-blue Buick Regal. We crawl into the back seat, then head off for my parents' house where the big Thanksgiving feast will be held. With this huge family gathering before us, my nerves are already piqued. Having my father-in-law drive us to the event does not help one bit in calming my nerves. First off, this is an old, unreliable car. The kind that stays covered in the garage and is only used on "special occasions" (my father-in-law believes wholeheartedly this car will only increase in value and become a classic). I'm not even certain we'll make it to my parents' house. Second, my father-in-law never, EVER drives. Any other day of the year, he is escorted around town by his own personal chauffer. I can't even tell you the last time he actually drove a car. In an attempt to distract myself and keep calm, I strike up a conversation with my father-in-law. "Hey, you know what I just realized?" I ask. "You've never met my brother. Could you please introduce yourself to him today?" In response to my comment, he turns around to face me, and gives me that big smile of his, where his grin stretches from ear to ear, exposing all his pearly-white teeth. It's the smile that everyone who knows him recognizes. Okay, I'll take that as I yes. Yep, total mayhem is unleashed. We arrive and there's like a long receiving line of family members to greet us as we walk through the door. (Please let me remember everyone's name.) Food smells meet our noses (should I be nervous that I don't smell turkey yet?). High-pitched shrills of little nieces, nephews, cousins and I'm pretty sure neighborhood kids pierce our ears. I say hi to aunts, uncles, distant relatives, and some folks who I don't even recognize and I'm quite sure are of no relation to us. My mom introduces me to the young lady currently renting the downstairs suite of their house. Meeting her in person only solidifies my earlier impressions I had of her. And I don't like her. Not one bit. Getting bad vibes from this one, alright. I'm convinced more than ever that she's only taking advantage of my parent's generosity and is going to rob them for all their worth. And this young lady does nothing to help win me over as she takes me on a guided tour of the private suite where she's residing, and points out all the expensive remodeling, newly appointed appliances, and paint projects my parents are funding at her request. Note to self: Must talk to parents about my skepticism of this so-called renter and her intentions. And also need to ensure mom and pop are saving up properly for their retirement. I head for one of the staircases leading back upstairs, but stop when I hear clanging sounds coming from the garage. I never liked this part of the house and it gives me the creeps. Our garage was built over an old burial ground of some sort. It may or may not be haunted. I slowly open the door leading to the garage and meekly call out (so as to not upset any spirits, just in case, you never know), "Anyone in here?" "Hello!" replies a man who's laying on the ground, working on some pipes, and appears to be very pale, very white, and covered in what I only hope and pray is dust and plaster, lest he be an apparition or some incorporeal being. "I'm the handyman!" he yells out, before I can let out a scream. WHY DO I NOT HAVE A GLASS OF WINE IN MY HAND??? This is very unlike me. I've already been here almost AN HOUR, and I still have yet to pour myself a glass of wine. It also occurs to me that I've blurted this statement out loud, right in front of two aunts, both of whom give me a nasty glare and I'm quite certain begin planning how they can do an intervention before the evening is over. I quickly walk away in search of the wine bar. Okay, much better now. Big glass of red wine in hand. I walk up the semi-circular staircase, past all the kiddies throwing stuffed animals and bouncy-balls over the side of the railings (the house has a big, grand entrance room where the staircase and second landing is open and looks down upon the floor below), when I overhear one of the kids say something about eating FROZEN STEAK today?? Ha-ha-ha! I laugh to myself. Silly kid, it's Turkey Day! Surely, this is not a relative from my side of the family. Yep, it's that one day of the year when we all sit around and carve the Big Bird. All year long, I patiently wait for this one November day when I feast upon a large gallinaceous bird: Meleagris gallopavo. Preferably one that's been soaking in a homemade brine for at least 6-8 hours prior to roasting. Also, strongly preferable that it's free-range, grass-fed, and has not been bloated with hormones or water. But that's not what's important here, it's that we're all gathered together, the whole family, thankful for all we.....WAIT!!! Hold ON!!! WTF?! Why is there no aroma of turkey emanating from the kitchen???? (All these preceding thoughts I say to myself; there are little kids standing around me, after all!). My mom and mom-in-law are in the kitchen, laughing and talking and stirring bowls of something. My eyes do a quick scan of the counter top, and UGHHHHH! NOOOOOO!!! There it is. That pale, pink styrofoam packaging that no decent, fresh, sustainably farm-raised meat should ever come in. Cellophane still in tact and tightly wound around the steak. And yep, the steak's frozen solid, with bits of ice crystals clinging to the inside of the cellophane. And no turkey bird in sight. I take a sip of my wine. And then I see the mixed veggie medley cans. The ones where the carrots are cut into perfectly shaped cubes, the peas are on the edge of being neon green, and the sodium is off the charts. I turn around and make for the exit so as to avoid saying something I'd later regret, when the moms ask me over to look at something. I take another sip of my wine. What I see: something resembling a baked potato shell, filled with some form of filling that's one-part dark liquid and one-part oily substance. I'm afraid to ask, and I don't have to: They inform me they whipped up my recipe for chocolate lava cakes for dessert. I take a very large sip of my wine. Trust me. This is not what my chocolate lava cakes are supposed to look like. But at this point, this is about the last thing wrong with this entire picture. I'm out on the staircase balcony, looking down at all the stuffed toys on the ground below, when I see something out of the corner of my eye. There, down there by the garage door. Just perfect, stress-level off the charts and now I'm about to experience my first run-in with a dead person who's been buried under our garage floor. Then I hear it. A faint, ghostly whisper over my shoulder, "Looks like you need more wine." Of all things I could possibly imagine an ethereal being would say, this was not one of them. Yet, as I look down at my glass, they are completely and absolutely right! The bottom of my wine glass is indeed visible! Just to make sure I haven't totally lost it, I yell out, "Did anyone else just hear the ghost?! What did you hear it say?" One of my relatives responds, "It said, "Looks like you're all having a good time."" Perhaps to a spirit that ceased to exist who knows how long ago, all this might look like a good time. For me, I decide to go with my interpretation of the spirit's astute observation and head directly for the wine bar. As the title indicates, this truly was a nightmare/dream I recently had, and does not reflect any actual Thanksgiving event. The people, places, events, ghosts, etc presented here are fabrications of my unconscious imagination and do not represent anything based in reality. Oh, and my father-in-law that I reference in the beginning paragraphs, the one who has a big grin, a chauffer and doesn't ever drive himself?? As what always seems to inexplicably happen in dreams, my father-in-law was President Obama. So you see, I had to edit out some parts, otherwise you would have know from the get-go something was amiss. While I have wonderful memories and have spent amazing Thanksgivings with close family, relatives, good friends and neighbors, I'm very much looking forward to a quiet, cozy holiday this year with just my husband, dog, and maybe a stray friend or two. And some wine. Since this was most likely the last "training" hike before our trek up Mt. Whitney, we wanted a hike that would give us one final challenge. And I think this one did it! We headed to Mt. Tamalpais State Park, and the first part of the day was spent on Temelpa Trail, which was less like a trail and more like a very dried-up narrow creek bed. This trail had close to a 2,000 foot elevation gain and was a fairly direct route right up to the east peak and summit of Mt. Tam. Phew, that got us sweating! We then headed for the north side of Mt. Tam, taking the...wait for it... Northside Trail. This relatively flat and shady trail was a nice break after coming up the Temelpa Trail. Next, we branched off Northside Trail to take Colier Spring Trail. And basically climbed up what was equivalent to a 50-story building! While short in distance, this trail took us up from about 1,800 feet to 2,300 feet. And no, there was no elevator to take us to the top. Finally, Miller Trail to Hogback Fire Road which were mostly downhill. Hey, we need practice hiking downhill, too! Total mileage: about 9 miles. If we're not ready for Mt. Whitney at this point, I don't think we ever will be! Our GoPro camera goes with us again on another hike. This hike, from August 18, 2013, covered several different trails in Mt. 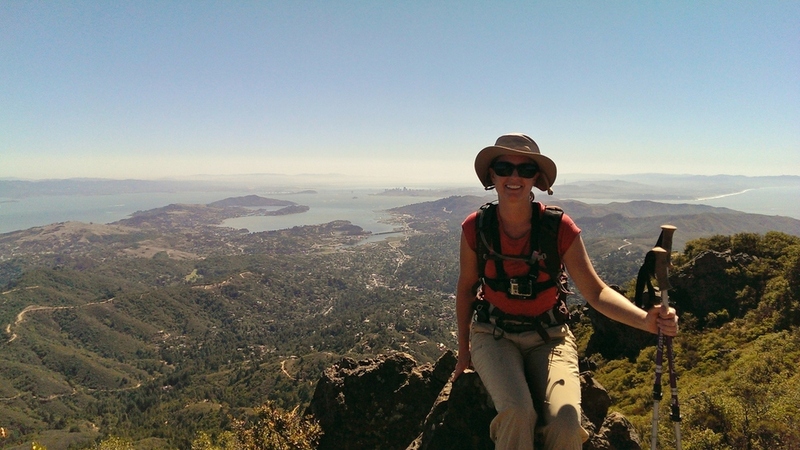 Tamalpais and Muir Woods State Parks. Some of the trails covered during this outing: Dipsea, TCC, Troop 80, Lost and Sun Trails. Highlights included Matt hitting his head on a tree, stumbling upon the Alice Eastwood Campground with a meditation seminar in full-swing (shhh! quiet voices only), and hiking past the German Tourist Club (which brought back memories of a past Octoberfest celebration we spent there with friends). Total hike: about 11 miles. This is a great half-day hike to take if you're ever in the Lake Tahoe area. It's about 5 miles round-trip, dog-friendly, and you get beautiful views of the Alpine Meadows valley and ski resort and the Granite Wilderness area, and you even hike next to some (not in use) ski-lift towers. Bear (our dog) and I had fun exploring the area to see if we could find all 5 lakes; we found 4. And yes, Bear had to swim in all of them. It's a pretty mellow hike, with about 900 ft. elevation gain. Follow Bear as he leads the way on this hike. We filmed this hike using our new GoPro camera. The hike was about 10 miles with 1,200 foot elevation gain and took us about 3.5 hours to complete. This was our first hike up to Marlette Lake -- what a beautiful, secluded alpine lake! The trail started at Lake Tahoe level (6,224 feet) and was a moderate uphill trek to Marlette Lake. Part of this hike paralleled the famous Flume Trail. Bear (our canine companion) especially liked the part of the hike where he got to splash around and cool off in the lake. Follow Bear as he leads you on the hike up to Marlette Lake! Mount Whitney. Photo credit: Geographer, Wikimedia CommonsThen when I heard this person say it's the highest summit in the lower, contiguous 48-states, my next thought was, "I want to do that someday!" But it wasn't until a recent visit with some friends that the generic "someday" would turn into a very specific date in late September. This was opportunity knocking. A chance to spend time with great friends and create unforgettable memories. An epic hike with my husband on new terrain. A possibility of checking off an item from the bucket list. I could feel that obscure and latent competitive gene of mine floating to the surface. So then, why did I suddenly have a huge pit in the bottom of my stomach, feel apprehensive, and hesitate in immediately accepting their invitation? Oh, that's right: fear. Fear of failure. Fear of not making it to the summit. Fear of getting altitude sickness. Fear of having to give up and turn around. Fear of not succeeding. After mulling it over for several days, I realized fear is a pretty stupid reason not to even give it a try. How unfortunate (and dare I say, cowardly?) it would be to completely pass on this opportunity just because I'm afraid I may not complete the ascent. So, challenge accepted! 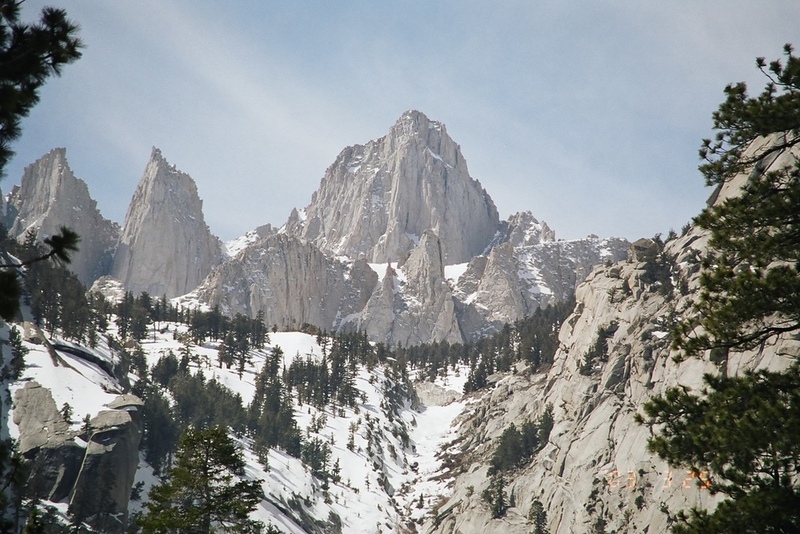 We'll attempt to summit the 14,505 foot tall mountain in a single day via the Mount Whitney Trail. And even if failure becomes inevitable, I know it will still be an amazing day with incredible scenery, and it will be time well-spent with my husband and wonderful friends. I'll just have to submerge that competitive gene and save it for another challege. Yesterday we undertook our first "training" hike to help prepare us for the Mount Whitney Challenge. 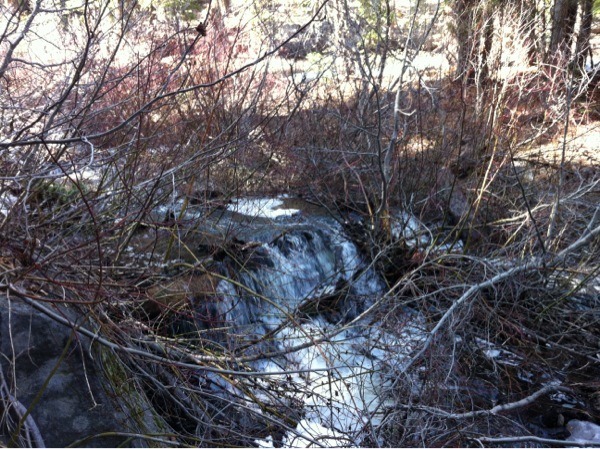 Listed as a moderate to difficult hike, the Shirley Lake Hike was close to 5 miles round-trip. True, the distance covered was nothing compared to what we'll need to do on Mt. Whitney, but the hike had a 1250 foot elevation gain, had steep sections to navigate, and there was a lot of scampering over large rocks and granite slabs. Our legs definitely got a work-out! And the scenery was amazing: we passed several waterfalls, had a wonderful view of the valley below, and glimpsed Shirley Lake (which we've been to before, but this was the first time seeing it without snow covering it!). And Mother Nature so graciously contributed to our training by bestowing upon us an array of weather conditions! Initially, we had the 80+ degree temperature and hot sun to contend with. Then, almost out of nowhere, dark and threatening clouds appeared (this too served as a training point: as soon as you see storm clouds, descend!). Lastly, and completely unexpected: hail! And lots of it. We sought out shelter the best we could, but it soon became apparent that the storm was not letting up. So we completed our training hike in the rain while cautiously, yet quickly, descending the slippery granite, climbing down rocks, jumping over slick mud puddles, hopping over now-gushing streams all while getting pelted with hail. Let's just hope this training exercise is not entirely indicative of our Mount Whitney adventure! Yesterday we completed an 11.5 (okay, 11.47 to be exact; excuse me for rounding up!) mile hike, with a 1,900 foot elevation gain, through parts of Mt. Tamalpais. No major weather events to report, other than the usual coastal fog. We had ocean views (when not obscured by the fog! ), walked under thick redwood canopies, followed along running creeks and a few waterfalls, and traversed across sweeping grass fields. We even got to see the Mountain Play Theater atop Mt. Tamalpais. 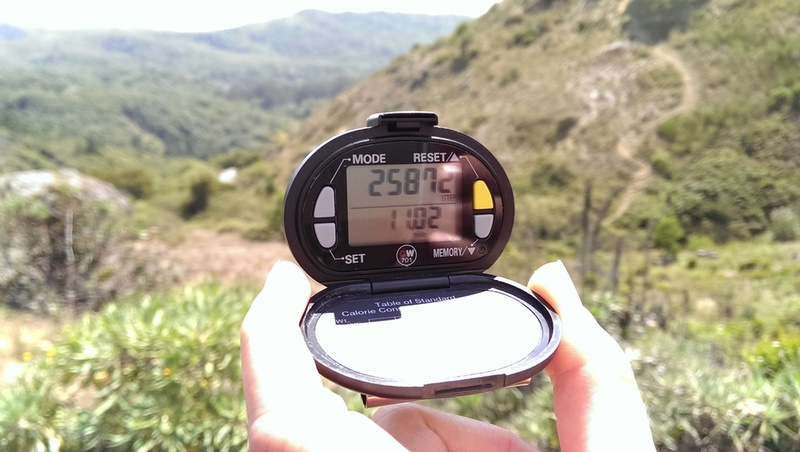 Matt took a picture of my pedometer as proof of the distance covered on our hike. July 27, 2013. 10 miles in 3.5 hours with 1,200 foot elevation gain. This was our first hike up to Marlette Lake -- what a beautiful, secluded alpine lake! The trail started at Lake Tahoe level (6,224 feet) and was a moderate uphill trek to Marlette Lake. Part of this hike paralleled the famous Flume Trail. Bear (our canine companion) especially liked the part of the hike where he got to splash around and cool off in the lake. A peek of Marlette Lake as seen from the trail. To sum it up, as the name implies, our Mt. Diablo hike was the devil's hike from hell. Don't get me wrong, it was a tremendous day-long training hike for us and had amazing, sweeping views of the east bay and beyond, but this was way more strenuous than we were expecting. And the 80+ degree weather and very sunny, exposed sections further made us feel like we were climbing our way out of the bowels of purgatory. Much of the hike was a constant uphill climb, with a total of ~2,960 ft. elevation gain. We took different trails on our way down, expecting (hoping) for some relief but alas more devilish trickery was at hand! We descended some very steep fire roads that were covered with a gritty and gravelly surface that made it precarious and slippery. Oh, and did I mention all the poison oak? Throughout the entire hike, I kept pointing out poison oak, giving it a wide berth, and warning Matt to stay clear of it. While descending and working hard not to slip (see above paragraph...), guess who fell? And in an attempt to stop the fall, put her hand down directly in a patch of poison oak? Hint: the author of this blog and the person who was paranoid about it all day long! I'm telling you, this was just more of the devil's work at hand! For this training excercise, we took several different trails, some involving some big uphill climbs. Overall, great trails and beautiful scenery. Highlights included Matt hitting his head on a tree, stumbling upon the Alice Eastwood Campground with a meditation seminar in full-swing (shhh! quiet voices only), and hiking past the German Tourist Club (which brought back past memories of an Octoberfest celebration we spent there with friends). Total hike: about 11 miles. Yesterday we completed a roundtrip hike of the Dipsea Trail almost in its entirety (minus about 2 miles of it), and clocked in a little over 13 miles. Our hike started up on the Panoramic Highway, took us down to Muir Woods Park, then back up (highest elevation reached was 1,360 feet), then back down a series of what seemed like never-ending stairs (all the while knowing we would have to climb back UP these stairs on our return trip!) to sea level. Our half-way point: Stinson Beach where we ate our lunch, watched all the Labor Day Weekend beach goers fire up their grills, and rested our legs. And yep, all those stairs going back up from the beach were brutal! But we did it. On our return trip we had incredible views of the enormous fog bank which looked more like a giant tundra of snow covering the Pacific Ocean as far as the eye could see. Completed the entire trail in about 6 hours. There was a lot of up, down, up, down on the trail and we estimate our total elevation gain was about 3,500 feet. Not too bad, and a very good practice hike with only about a month left until our Mt. Whitney climb. September 15, 2013 --Since this was most likely the last "training" hike before our trek up Mt. Whitney, we wanted a hike that would give us one final challenge. And I think this one did it! The first part up Temelpa Trail, which was less like a trail and more like a very dried-up narrow creek bed, was close to a 2,000 foot elevation gain and was a fairly direct route right up to the east peak and summit of Mt. Tam. Phew, that got us sweating! We had a bird's eye view from the summit: we could see boats in the bay that were lining up for one of the America's Cup races, the tip of the Golden Gate Bridge, Mill Valley, across the bay to Mt. Diablo, and we even had a clear view of the Farrallon Islands! So we know the visibility on this day was at least 25 miles! Total mileage: about 9 miles. If we're not ready for Mt. Whitney at this point, I don't think we ever will be! The bright red tips of Snow Flowers can just barely be seen emerging from the fallen pine needles and forest floor. They start to appear right after the snowmelt, and are sometimes seen in unsuspecting places. Vacancy signs everywhere. Empty hiking trails. A deserted downtown. A feeling of having this area to oneself, knowing that soon the summer crowds will be here. Whether it's solitary daffodils popping up in random spots, or a neighbor's densely planted flower bed, these cheery flowers seem to express gratitude that the winter months are over and it's now their time to come out of hiding and shine. Nature starts revealing vibrant colors in the landscape, but they’re often contrasted with the remnants of snow, a pale sky, and brown and budless foliage. Silent and mostly frozen throughout the winter, the creek at the back of our property has once again resumed its constant burbling and babbling. When you think about it, there are a lot of sayings and songs that talk about rain. Which to me is a bit odd since most people seem to despise the rainy weather, don't like to talk about it, and want it to stop and go away. But not me. I like the rain. I welcome it. Especially when I think about how the rain often times translates to snow in the mountains! To me, the rain is Mother Nature's way of giving the earth a good cleansing. An opportunity to don my rain boots and wash away all the dust on them. A rinse-cycle for the sidewalks. Liquid therapy for all the plants and flowers that greet me on my walks. So for me, I'm singing in the rain, just singing in the rain; What a glorious feelin', I'm happy again! Since our hometown team is playing in today's SuperBowl, we decided a standard menu of chicken wings, potato chips and store-bought dips just wouldn't do. Instead, we opted to test out a few new appetizer recipes to mark this occasion and what will hopefully be a win in our Quest for Six (don't worry Steelers, you're still #1 in our hearts!). The recipes come courtesty of Caroline Fey and Meghan Ellis at the City Kitchen, which never disappoints with their menus and culinary creations. Our "Supperbowl" menu covers as much of the culinary field as we're hoping Colin Kaepernick will do in today's game: one healthy hummus spread, a spicy tapas dish, and a hearty sausage dip. Little Spanish Meatballs with Shaved Manchego Cheese & Grilled Bread: The spiced aroma coming off this dish is incredible -- cinnamon, nutmeg, smoked paprika and cumin. Meyer Lemon Hummus with Carmelized Shallots and Homemade Pita Chips: The shallots and lemon juice add a special twist to this dip. Warm Sausage Dip with Fire Roasted Tomatoes & Mascarpone Cheese: Sausage and cheese...'nuff said. Every camping trip we've ever taken always offers its own unique experiences, lasting memories, and fun times. Even though it had been over a year since our last outdoor adventure, our camping trip a couple of weeks ago was no different. The exception being that this time we decided to head down south to Big Sur, California. It had been years since we last made a trek to this part of the state, and we had forgotten how beautiful this area is. It truly is a special and magnificent place where the mountains of the west and rugged coastline abruptly meet the great expanse of the Pacific Ocean. Rocky outcroppings, pristine beaches, sheer drop-offs, enormous bluffs -- there are breathtaking views and blue waters everywhere you look. And let's not forget all the marine mammal sightings! Our destination: Kirk Creek Campground. Listed by Sunset Magazine as the 6th best campground in California, Campsite #22 we were not disappointed! We pitched our tent on the coveted Site #22 which offered amazing views of the ocean to the west, the rugged coastline to our north, and the steep Los Padres Mountains to our east. Our campsite was a stone's throw from the edge of a bluff dropping off 100 feet to the ocean...literally. Seriously. At dusk, we had a front-seat view to the setting sun and its changing colors; at Sunset over the Pacific Oceannight, we watched the display of stars on a completely black canvas, then drifted off with the waves of the Pacific Ocean lulling us to sleep. The morning view wasn't bad either: we spotted sea lions basking on a nearby rock outcropping and saw a school of dolphins swim by as we sipped our coffee. 1. A long hike through the Ventana Wilderness and Los Padres National Forest. The constant incline of the trail was hard work, but we were rewarded with incredible bird's eye views of the rugged coastline, the ocean, the adjoining mountains, and even our campsite off in the distance! 2. Beach time at Sand Dollar Beach. Our dog, Bear, especially enjoyed this outing as he got to splash around in the ocean and play an endless game of fetch! 3. A visit to McWay Falls in Julia Pfeiffer Burns State Park. Tucked away in a picturesque lagoon, the waterfall drops 80 feet from a cliff to the beach, and is the only coastal waterfall in California. Yes, sir -- Big Sur is a very special place, and all the better when you can pitch your tent right on the water's edge! For me, panting is how I cool off in hot weather. Since I can't sweat or take off my fur coat (see above), sticking my tongue out and panting allows me to circulate air through my body to help cool me down. Next time you humans complain about being too hot and how you need to cool yourself off, try doing what we doggies do: stick your tongue way out of your mouth and try panting for several minutes. Go ahead...try it. It starts to get uncomfortable after awhile, doesn't it? Do you feel a little silly with your tongue dangling out of your mouth? Now imagine a tongue twice as long as yours! Finally, let's talk paws, er uh, feet. Bark! We have FOUR of them, how many do YOU have?? Sometimes this comes in handy, but during the hot season, it can be doubly problematic. For example, did you walk over five miles yesterday in your bare feet on scorching hot rocks and black tarmac that had been baking in the sun all day? And I bet you probably wear your flip-flops to the beach to avoid stepping on blistering hot sand. I'm a lucky dog 'cause my parents do a good job of steering me towards shady sidewalks and cool dirt to walk on which helps my dogs from barking too much (they've tried the doggie-bootie thing on my paws, but I kept losing them!). They also check my paws often to make sure they're in good working order with no cuts, blisters, or other owies. Just sayin', from my doggie perspective, it could be a lot worse for you humans during all this sweltering summer heat. 1. Water, water, water! And lots of it! For drinking, of course, but also the FUN kind of water you wade Playing in Lake Tahoe is a "paw-fect" way to cool off! and splash into. My people always have water for me wherever we go (even to the park and on hikes), and they have a fun little travel doggie drinking bowl just for me (but grrrr, seriously, what's wrong with me sharing YOUR water glass with you?!) The lake, a pond, the river, a pool, the bay! These all help to cool me off. Then when I get out of the water, I like to help my humans cool off by shaking some of the water off on them. Ruff! Ruff! For some reason, which my canine brain doesn't get, they usually react to this with a growl and snarl of their own. 2. Cool spots in the shade. You don't have to be picky. Any shady spot will do. Especially This shady spot has dirt, dust, and pine needles to help keep me cool.ones that have refreshingly cool dirt, or even moist, damp sand. That can really help cool off pups and people alike. But for me, my favorite cool spot in the shade? One that has fresh mushy, squishy mud, woof! It feels so chill and refreshing when it sticks all over my belly and coats all my fur on my underside. Even in the biggest park with all that fancy green grass, I can always manage to find the one, small spot of mud to lay down in. Which makes one bark the question, "Why isn't there more mud at the park?" Huh. See, and you wondered how beneficial advice would be coming from a dog! I hope this helps both you and your canine companion alike and makes your Dog Days of Summer more "Bear"-able. Arff! Arff! This past weekend the annual Fillmore Jazz Street Festival was held in San Francisco, packed with arts and craft booths, food vendors, beer gardens, and lots of live music. The Pets Unlimited Shelter & Adoption Center also had a booth set up offering dog and cat treats, biscuits, and goodies to help raise funds for all the shelter animals. To help with the cause, Bear (ahem, Jen) baked up a batch of Bear's Homemade Dog Biscuits to donate to the shelter's bake sale. Bear's Homemade Dog Biscuits are pretty simple to make, and use ingredients both canines and humans alike can eat: Flour, Extra Virgin Olive Oil, Bear says, "They're paw-lickin' good!!! "Organic Unsweetened Applesauce, Cheddar Cheese, Egg, and Homemade Chicken Stock. Both Jen and Bear have done taste-tests on them; Jen likens the biscuits to bland crackers, and Bear says they're paw-lickin' good. Of course, it's the dog bone-shaped cookie cutter that makes all the difference! Biscuits, fresh out of the oven. Bear inspects to ensure they've been baked to paw-fection. Once out of the oven and cooled off, the biscuits were packaged up and ready to go to the bake sale. A list of ingredients was included on the packaging to help out the finicky eaters. The Pets Unlimited Shelter & Adoption Center bake sale was a success! A little over $2000 was raised from the sale of all the baked goods! Both Bear and Jen like to think that Bear's Homemade Dog Biscuits were in high demand at the sale, and are tail-wagging and smiling (respectively) knowing that some of the money raised for the shelter was a result of their contribution. Barking Dog. Satan's Cesspool. Hospital Bar. Bouncing Rock. Ambulance Ride. These all sound like things you want to avoid in any given day. But for Matt and me, we conquered them all yesterday!!! These were just a few of the Class II and Class III rapids we encountered on our whitewater rafting adventure on the South Fork of the American River in the foothills of the Sierra Nevada mountains. After collecting our helmet and lifejackets (safety first, last, and always! ), and listening to the safety speech and "Rules of the River" from one of the Adventure Connection river guides, we boarded a bus and headed a few miles upriver. There were seven of us who loaded into the raft, and along with our guide, Brian, we set off for our day-long journey down the river. The initial calm waters gave us the opportunity for some practice paddling. Matt and I were both a bit alarmed to hear the nervousness and despair in our guide's voice as he tried repeatedly to instruct us all on the perfect paddling technique and get us paddling in a perfect synchronized rhythm (hey, don't look at me and Matt...there were two kids under the age of 12 and a Lithuanian who barely spoke English on our raft!). But shortly, we worked out the kinks and were soon sailing through the waters like a well-oiled...raft. The first hour or so was fairly mellow, with only a couple Class II rapids and little paddling required on our parts. Our confidence in our guide, Brian, grew quickly during this time as we saw one raft get caught up on a rock (in what was supposed to be the easy part of the river! ), fill up with water, and lose two of its rafters! We stopped at the American Connection campground for lunch, then headed out for the second -- and more intense-- part of our river rafting experience. During this part, we power-paddled through Class II and Class III rapids, gently paddled through calm waters, saw beautiful riverside scenery, rafted through gorges, and even saw some river otters! Oh, and got wet...and on some rapids, got very wet. And in Matt's case, got very drenched. He was seated in the front of the raft and blocked a lot of the water from spraying the rest of the rafters (especially me, who was seated directly behind him :-D). Despite the frigid water temperature (the guide estimated it was upper 50's, low 60's), the sprays of water, and yes, okay, sometimes downright drenching! !, felt refreshing given the hot, dry temperatures of the day. Despite our initial paddling inadequacy, our raft made it through the day without a serious snag on a rock, we lost no rafters, and did not capsize. The day ended at Folsom Lake, where all the rafts joined together and were transported across the lake via a jet ski. We boarded the bus, headed back to the campground, changed into dry clothes, and couldn't stop talking about how much fun we'd had. We definitely plan to go whitewater rafting again, and are now ready to conquer Class III and Class IV rapids. Last week, I left the city life behind me (for several hours, anyways) and headed for the foothills of Mount Diablo for a 3+ horseback ride at Isabella Farms. It's amazing how within a one-hour drive one can completely leave the city, traffic, and freeways and find oneselve out in a rural area where two-lane roads, silence, wild turkeys, and horse farms are the norm. Isabella Farms is a beautiful ranch, complete with a little over a dozen horses, two goats, chickens (yes, cage free! ), two cats, and a young Doberman Pinscher pup named Daisy (whose job is to keep away the coyotes and bob cats; okay, as a 5 month old puppy, she has yet to grow into this role, but one day will). Once there, I headed out to the pasture to round up my trusty steed for the journey: Justice. And he was one high-spirited and magnificent horse who did justice on making me work hard on my horsemanship skills! As it turned out, I was the only one who showed up for the trail ride (how nice!). And I couldn't wait to head out on the ride with my guide, Lindsay. The clip-clop, clip-clop of the horses' hooves on the ground, the snorting sounds coming from Justice, the swishing-sound of the horses' tails as they tried to chase away the flies...it quickly brought on a feeling of peace and tranquility. Of course, the landscape didn't hurt either. We took a trail through the foothills that first started out with a canopy of trees covering the wide path. With poison ivy and poison oak lining the path. Then, the trail significantly narrowed to a very tight line that led us through open, rolling, grassy areas dotted with low, stubby trees; this part made us feel as if we were riding through Frodo's homeland of The Shire (while dodging more poison ivy and poison oak). But the truly breathtaking part of our journey was when we reached the ridge and had a bird's eye view of the valleys below us and Mt. Diablo in front of us. And it literally was a bird's eye view -- as I looked to my right I was level with a crow that was about 40 yards away just hovering and soaring in the wind. Speaking of wind, this was also the windiest part. And the coldest part. Sitting atop our horses, we could see the wind rippling across the tall grasses. It reminded us of big waves way out at sea moving through the ocean. After some steep descents, more grasslands, and more poison ivy and poison oak, we were on our way back to the ranch. It was an amazing day with amazing views. And Justice was well served. And I don't know what surprised me more: waking up the next morning with no poison ivy (which I was certain I had) , or waking up with no sore bones (which I was certain I would)! Watson Creek running like crazy in our backyard. It doesn't happen too often, so when the thermometer in San Francisco hits 70+, it's time to get out and enjoy the beautiful weather! What better way to spend the day than with friends at Zeitgeist? With their incredible beer selection (I mean Zeitgeist, not my friends), like Stone Pale Ale and the amazing outdoor "beir garten", this is a great way to soak up the sun and SF atmosphere. We were surrounded by bikers, hipsters, and drunken Brazilians, but everyone had me pegged as the Pac Heights' Urbanite when I whipped out my iPhone to do my obligatory FaceBook posting. Apparently, they forbid folks from taking pictures here; we were reprimanded by one of the bar keeps when I asked a fellow "beir-gartener" to take our group photo. I guess like Vegas, what happens at Zeitgeist, stays at Zeitgeist! Okay, let's blockquote this so it looks really important: Hello. And welcome to my first blog posting. Wow. Does this mean I'm now a blogger?